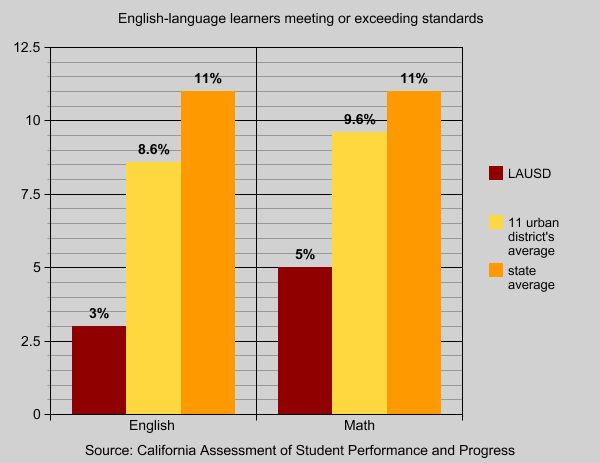 Among all the subgroups of LA Unified students who took the state’s new Smarter Balanced standardized tests, English language-learners (ELL) produced especially disappointing results, finishing behind the state average for ELLs and near the bottom compared with the state’s 11 other large districts. LA Unified has the most English learners of any district in the country, at roughly 155,000, and a troubled history of educating them. In 2011 it settled a complaint by the federal Department of Education’s Office of Civil Rights, which found that the district had failed to provide adequate services to English learners. As part of the agreement, the school board passed an overhauled English Learner Master Plan in 2012 meant to increase services for ELLs. In the English language arts part of the new statewide tests, only 3 percent of LA Unified’s ELLs scored in the top categories — exceeding and meeting standards — and only 5 percent did so in math. That compared with 11 percent in both subject areas statewide for ELLs. Compared with the state’s 11 other large districts, LA Unified’s ELLs finished second-to-last in English language arts, ahead of Frenso and Oakland by a single percentage point in the number of students meeting or exceeding standards. In math, the district’s ELLs tied for second to last with San Jose and Oakland at 5 percent, with Fresno coming last at 3 percent. San Francisco led the pack with 21 percent of its ELLs scoring in the top categories. The 11 other districts averaged 8.6 percent in the top categories for English and 9.5 percent in math. Hilda Maldonado, director of LA Unified’s Multilingual and Multicultural Division, said the district is still analyzing its results and trying to determine how many of the ELLs who took the test are at the beginning of English language acquisition and how many are near the end. A difference in those numbers could explain the district’s relatively poor performance. But LA Unified also doesn’t provide the same level of services as the top performer, San Francisco, which has roughly 30 percent of its ELLs enrolled in bilingual programs, compared with a five percent average around the state. At LA Unified, Maldonado said, bilingual programs are only offered at about 60 of the district’s 1,000-plus campuses. “The services that San Francisco offers, we don’t offer at that higher rate, but we are looking to expand the duel language and bilingual language programs. That’s one of the charges that is under our office this year,” she said. To what extent the district is exploring an expansion, Maldonado said, is still under discussion. She also pointed out progress the district has made since the settlement with the feds: One of the major problems the federal investigation found was the district’s high level of long-term English learners who were not progressing after years of instruction. “I think we’ve been able to cut [long-term English learners] by about 10,000 to 15,000 students. We started off with about 40,000 long-term,” Maldonado said. The district’s poor ELL performance could also add fuel to a lawsuit brought earlier this year by Community Coalition South Los Angeles and a parent that accuses LA Unified of improperly calculating and distributing money from the Local Control Funding Formula, a 2013 state law intended to direct extra money to high-need students. The result, they assert, deprives low-income, foster youth and English language learners of $2 billion in funds that should be directed to their education. Maldonado sidestepped the question of whether the district needs to dedicate more LCFF funds to its English learners. “Rather than say it costs more money to educate these children, our office thinks of it more from the perspective of, look at his wonderful assets these kids bring by having a second language,” she said.